Patrick Fallon, after earning a degree in leatherworking, joined Hermes' Trunk shop in 1981. Over three years, he acquired the legendary know-how of this exceptional brand. In 1984, Patrick Fallon opened his shop in Annecy, making and selling his own creations. "FALLONCUIR ®" is a leatherworking factory relying on cutting-edge know-how and exclusively French handmade products. Patrick Fallon, a member of the Great Workshops of France (Grands Ateliers de France) and Journeymen, shares their common values, which are the culture of excellence, attention to detail, and passing down their knowhow. The creation of the "FALLONCUIR ®" pocket humidors was born of a simple need. Patrick Fallon was in the habit of forgetting his cigars in cases, where they would dry out. "Since I couldn't find the ideal case, I created it," says Patrick Fallon, proudly. By mastering an exceptional technique and first-choice leathers, your pocket humidors will keep your "Puros" under excellent humidity conditions. These pocket humidors do not require a humidifier, and your cigars will have the best of protection, even in harsh environments like the desert, jungle, snow, and cold. Since no product on the market met his requirements, for Patrick Fallon, the logic of creation and research came about on its own. NIXES are three female water sprites whose statues represented "the efforts" in Greek mythology. This Pocket humidor for 3 cigars will keep your Puros under the best conditions for 7 days. WALLABY is an Australian Aborigine word referring to small kangaroos. Pocket humidor for 3 cigars containing a cigar cutter in a pocket on the "belly" of the case. 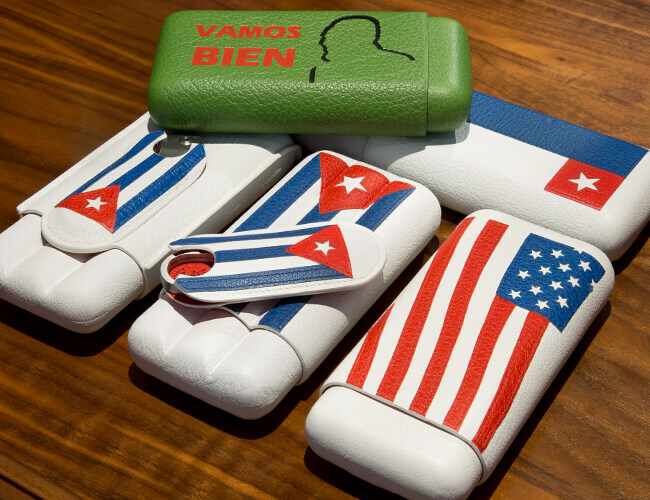 The "Vamos bien" collection represents the living history of Cuba through the different propaganda posters of the Castro regime. A photo proof accompanies each pocket humidor. Cigar cutter all stainless matching its case and the pocket humidor.